What comes to mind when you think about Fred Rogers? The zip-up sweaters and lace-up sneakers? The trips out into the neighborhood, where we meet people who do interesting jobs and make everyday things? The trolley and the Land of Make-Believe? For me, most of all, it’s the radically good man who entered through his door the same way every day and greeted each child with warmth, companionship, curiosity, humor, and respect for children’s feelings and questions about life. Director Morgan Neville has given us a gift in the documentary Won’t You Be My Neighbor? 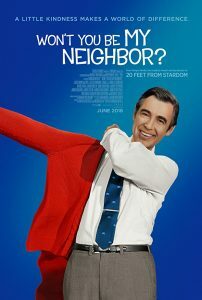 This film is a masterful, deeply moving collage drawn from “then” and “now,” including video excerpts from Fred Rogers’s 40-plus-year television career, news footage from events that took place in American life, and interviews with his widow, Joanne Rogers, his sons Jim and John, and colleagues and friends who bring his life and personality alive for us. In those early years, Rogers also studied child development at University of Pittsburgh, and went to Pittsburgh Theological Seminary on his lunch hours. The Presbyterian Church had to create a new category of ordination for him: ministry to families and children through television. His deep Christian faith and his sense of God’s call to love ourselves and to love our neighbor were at the root of Rogers’s entire life and work. As his friend George Wirth says in the movie, “Fred didn’t wear a collar, he wore a sweater.…It wasn’t a sermon…it was a communication right into their hearts.” When he was filming, he looked straight into the camera, and thought about the child who was watching. He was slow and quiet on purpose, giving each “television neighbor” time to observe, feel, think, respond. Some of the most beautiful scenes in this movie show the open faces and hearts of children as they interacted with Fred Rogers. With children, Fred Rogers had a remarkable quality of vulnerability and honesty. From his own childhood and from working closely with children, he knew that children are sensitive to what happens in the world around them, that their feelings are real and important, and that adults should find ways to listen and talk with children about life’s big questions, not shield them from reality. In Make-Believe, the puppets and set may have looked simple, but the work was never easy. Woven through Neville’s film are memorable excerpts from episodes about current events and difficult situations in life, including wars, Robert Kennedy’s assassination, the space shuttle Challenger disaster, death, divorce, disabilities. Mister Rogers used his puppets, his songs, and honest conversation to engage children and adults at a level that helped them express and handle their feelings and their actions. And like the parables of Jesus, Mister Rogers’s songs, Make-Believe stories, and wisdom are as relevant today as when they were first told. In the late 1960s, when Rogers invited the young African American singer Francois Clemens to be a police officer in the Neighborhood, racial tensions were high in America. In this movie, a news clip from that time shows a white hotel owner angrily pouring bleach into a swimming pool where black children were playing. At his house in the Neighborhood, with a blue wading pool and a garden hose, Rogers invited Officer Clemens to sit down and cool his feet for a while. After showing them both taking off their shoes and socks, the camera zoomed in and lingered on two white feet and two black feet in the water together, and two friends enjoying each other’s company on a hot day. Finally, Rogers offered Officer Clemens his own towel to dry his feet. A powerful lesson, taught without words. Now that person is you, and it is me. When I finished watching Won’t You Be My Neighbor? I felt like a pitcher full of goodness and gratitude had been poured into me, filling me to the brim with the desire to follow Fred Rogers’s example creatively and courageously. Make it a point to invite a friend and watch this movie. It will be released on DVD on September 4, 2018. Betsy Zahniser is a member of Trinity Covenant Church, in Lexington, Massachusetts. She and her husband, David, have three children who all watched Mister Rogers growing up, and now have families of their own.